Navitas Life Sciences, a wholly owned subsidiary of TAKE Solutions and a full service Clinical, Regulatory & Safety solutions and services provider today announced that it has been recognized as a ‘Leader’ in the IDC MarketScape: Worldwide Life Science R&D BPO Services 2018 Vendor Assessment (Doc # June 2018, IDC #US42144618). Leadership in this study is based on the breadth of life science R&D business process outsourcing services offered, geographical footprint and global delivery capabilities, industry-specific expertise, and diligent vetting of customer references to examine vendor capabilities. 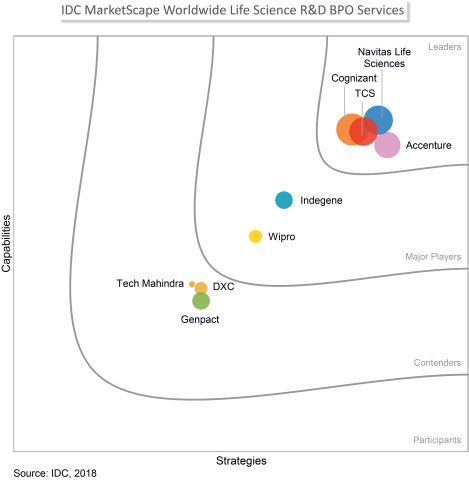 Navitas Life Sciences was one of nine life science R&D IT BPO vendors selected to participate in this study based on the IDC MarketScape’s stringent research and due diligence process. Alan Louie, Research Director of IDC Health Insights' Life Science R&D Strategy and Technology research, noted, "While still somewhat smaller than its traditional IT outsourcing counterpart, BPO in the life sciences remains an important contributor to industry success. The scope of life science R&D BPO continues to expand as more and more processes are operationalized and preferred IT partners are tasked with implementing and maintaining new processes and procedures. As a result, leading IT service providers are increasingly working as partners with their industry sponsors to deliver operational excellence while contributing to ongoing industry transformation that will ultimately automate well-defined, highly repetitive tasks. While IDC continues to expect that IT outsourcing overall will continue to grow by double digits over the next 5–10 years, we also believe that BPO spending has stabilized and should remain relatively constant over the near term." Navitas Life Sciences delivers platform-driven full-service Clinical, Regulatory and Safety solutions and services. As the dedicated life sciences brand of TAKE Solutions, Navitas Life Sciences operates across North America, Europe, Asia pacific and Latin America. Navitas Life Sciences combines the knowledge and experience of three legacy brands - Ecron Acunova, Navitas, and Intelent. Thus, Navitas brings together the capabilities of a full-service CRO, a technology-led life sciences services provider, and expertise in analytics and data sciences to address critical challenges and drive outcomes for life sciences. Navitas has over 30 years of rich experience across 330+ phase I-IV clinical trials, 20+ therapeutic areas, and 40+ successful GCP/non-GCP audits. Our trial expertise is augmented by OneClinical, a platform that delivers trial oversight, analytics, and insights to drive successful study outcomes. To learn more, visit www.navitaslifesciences.com.